Assembly bill addresses issue. But how much coverage does it provide? One of the many problems with the bill to repeal and partially replace the Affordable Care Act (ACA) is that it would seriously erode the current protections for millions of Americans who have preexisting health conditions. That’s a very unpopular part of the American Health Care Act (AHCA), the Republican health care bill, but there’s a lot of confusion about how it undermines coverage for people with chronic health conditions. The confusion was evident during a late night debate in the Wisconsin legislature last week, when the Assembly passed a bill that would purportedly protect people with preexisting conditions, but which largely misses the mark because it fails to address a huge loophole contained in AHCA. The muddled debate after midnight on June 22nd is a great example of why there needs to be a longer and more open debate about the version of AHCA that was developed behind closed doors in recent weeks. The bill approved by the Assembly, AB 365, had been introduced by Democrats and was intended to protect the part of the ACA that prevents insurers from putting annual or lifetime caps on insurance coverage. In a surprise move, Republicans voted in favor of a motion offered by a Democrat to pull AB 365 from committee and bring it to the Assembly floor. However, the majority party then replaced the original provisions of the bill – over the objections of Democrats who complained that their bill was being hijacked – with a substitute amendment that approaches the problem from a very different perspective. Prior to implementation of the ACA (“Obamacare”), insurers could deny coverage to people with health conditions – such as those who had ever been diagnosed with asthma, high blood pressure, or depression. Alternatively, insurers could charge those individuals higher premiums. In addition, they could limit coverage for people with serious or chronic health care needs by putting annual or lifetime limits on how much an individual has to pay for deductibles and copays. The Senate repeal and replacement plan would preserve those protections, and the House bill (AHCA) would preserve most of them – except the prohibition on charging more for people with preexisting conditions. 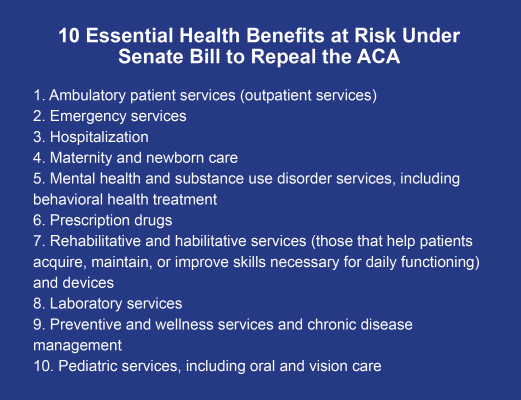 However, both bills contain an enormous loophole; they allow states to waive the requirement for insurance plans to cover 10 essential health benefits. States could choose to waive any combination or all of the essential health benefits under the ACA, and the protections discussed earlier would not apply to services that were not deemed essential. In states that approve such waivers – for example, by waiving the requirement to cover prescription drugs – a cancer patient requiring expensive chemotherapy could find early in their treatment that they had reached a cap on what the insurer will pay for the lifesaving drug. And a person who struggles with depression might find that the only plan he/she can afford is one that does not cover mental health treatment. The amended version of AB 365 does not close that loophole, so it does not resolve the biggest problem that the House and Senate versions of AHCA would cause for coverage of people with preexisting conditions. In other words, the Assembly managed to pass a bill that appears to give people with chronic conditions some assurance that AHCA will not undermine their coverage, but AB 365 falls far short of accomplishing that objective. The debate during the early hours of Thursday morning included some great statements by legislators in both parties about the importance of protecting access to quality, affordable health care for people who have preexisting health conditions. I hope that all the rhetoric was sincere, and that the fact that the amended bill comes up far short is because state legislators did not understand how the House and Senate versions of AHCA put health care at risk for millions of Americans who have chronic health conditions. Fortunately, there’s an opportunity for the state Senate to fix AB 365 and to prove that members of both parties truly want to protect health care services for people with chronic health problems and other preexisting conditions. No bill is ever going to work until we deal with the spiraling cost of health care itself and prescription medications. There is no way an epipen can cost $600 or an asthma inhaler $500 dollars, 4 pills for Imitrex to treat a migraine are $200 dollars and that’s supposed to last a month! 4 shots is $500 dollars. I have a friend who is paying over a $1000 dollars for 2 insulin medications. Then we have the procedures at different clinics and hospitals and how those varies. How can an MRI at Smart choice MRI be $600 while at a hospital its it $2000 or even $3000 dollars depending on the hospital. I saw a report where in Japan the same MRI is $100-$200 dollars. This is why we have the spiral of healthcare issues we do, even patents on drugs 10+ years out that should have generics are still too expensive. Why? Because of lobbyists who keep them inflated and keep the same old line of losing money. Is this the cart before the horse, or has the horse left the barn never to be found. Until we stabilize health costs and put mandates in place, this will continue to be an issue.